A rainy day, time to play at PPA! I got a chance to make this Halloween card for the PPA5 challenge. I also used the MojoMonday week #101 card sketch. I don't make many square cards but this 4 1/4 square one turned out pretty good. Lotta multi-tasking today for me! This stamp, Little Boo, is one of the ones in the back of the catalog on the under $10 page. It's too cute and the image coordinates with the 1 1/4 inch circle punch. It might be hard to see but I ran the Basic Black piece thru the Big Shot with the diamond texturz plate from the Backgrounds 1 set. And once again, the Razzleberry Lemonade papers are too versatile. I made this card for two Splitcoast Challenges. Color Combo #233-Chocolate Chip, Kraft and Real Red. And the sketch #243 here. I'm always in on anything to do with Real Red! 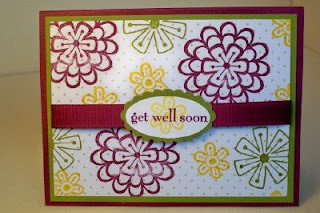 This card has a bit of retired designer paper-the polka-dot Kraft pattern is from the Patterns Pack Level 1 Hostess set of the Fall-Winter 2008 catalog. The stamp set is Two Cool Dudes and is really cute! I made this one a while back but just realized I never posted it. It's another birthday card for Home & School. I cut the Scallop Circle #2 bigger circle in half and stamped it with the flowers from Garden Greetings(dormant list)in Old Olive, Rich Razzleberry and Orchid Opulence. 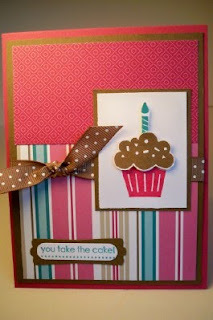 I used the oval punch and layered that over the scallop oval punch for the birthday wishes. Quick and cute! I FINALLY got to stamp today. I think that's why I'm so crabby-no stamping since Saturday! I've been helping my parents clean out for a garage sale. Lotsa stuff after 43 years of marriage in the same house. Then today and yesterday had 5 back to school meetings in two days. I'm the new Home & School President so I've got lots more work to do but I HAD to stamp. So this card was for this sketch from last week's Mojo 100th. 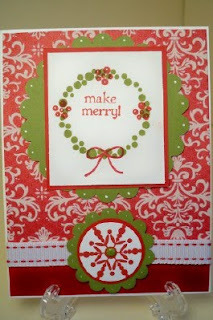 I used the Christmas Cocoa Specialty papers and the snowflake from the Berry Christmas set. 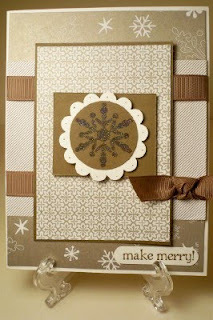 I stamped it in a VersaMark pad, sprinkled some Iridescent Ice Stampin' Emboss power and heated that up. It's much more sparkly in real life! It's Saturday and that means a new sketch here at Stamping 411. I know I'm repeating myself but these sketches are the best! They're pretty basic but help me whip up a really cute card, really fast! 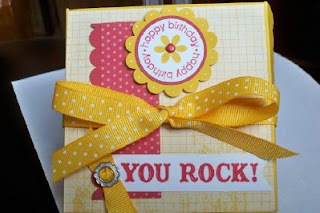 I need more birthday cards for Home & School so I made this one with the Thoroughly Modern papers. Another Wednesday, another Splitcoast Card Sketch here. If you haven't tried these, they're the bomb! As I've said before you can just trace the dimensions and have a really cute card, really fast. I needed a unisex card for our Home and School Association to have on hand so I thought this would fit the bill. 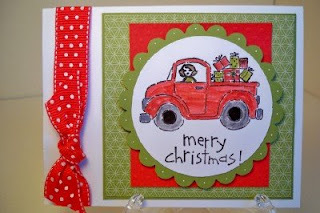 Another card done for this sketch over at Stamping 411. I really look forward to these sketches because they're very simple yet result in really nice cards! I needed to make some all occasion cards so I stuck with the One of a Kind stamp set. 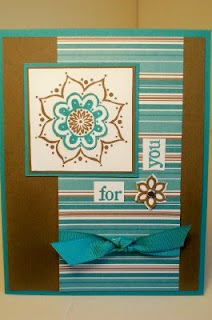 This coordinates with the Boho blossoms punch so it's really easy to stamp and punch. And I'm really liking the Thoroughly Modern designer papers too. They're bright and cheery! Better late then never! I finally got a quick chance to stamp today and this card came together in less than 10 minutes(after it took longer than that to decide which stamp set to use)!I followed this sketch #241 on Splitcoast. I can't say enough how easy these are to follow, especially if you print out the sketch because it prints out to the exact size of an A2 card! Then you can just trace and cut and you're good to go!!! 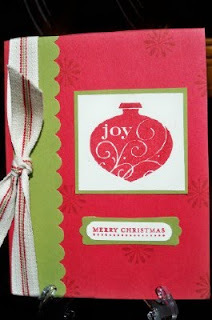 With this one I colored the stamp with Soft Suede, Bermuda Bay and Rose Red Stampin' Write Markers. 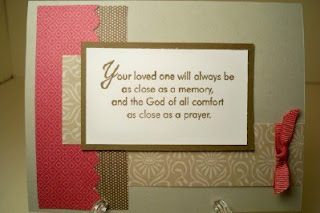 I left off a sentiment because I needed to make some all occasion cards for a custom order. Easy peasy! 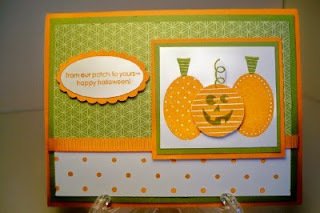 As I mentioned, I got my Holiday Mini pre-order and made this card with the Pumpkin Patch set. 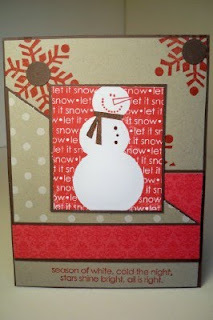 I also used this week's Stamping 411 challenge here. This set is too cute! You can just stamp the pumpkins and the stems or add one of three faces to make a jack-o-lantern. 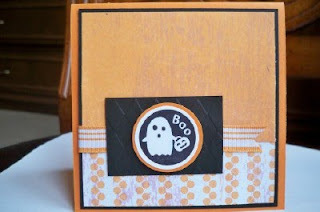 I will get lots of cute Halloween cards made with this set! We're back from a fun weekend in St. Louis! We had a great time with the DeMarco family! They live in Kirkwood and it's just a darling town. So today I'm trying to catch up on laundry, sketches and challenges so I'm playing along again at PPA! 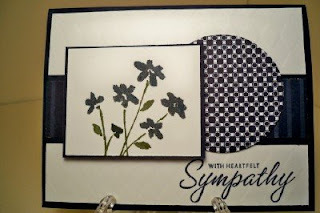 This is a Stampin' UP demonstrators blog with fun challenges. Last week was a color combo and this week is a sketch challenge. 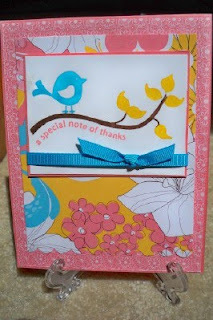 I need a bunch of thank you notes so I made this one using the Cheep Talk stamp set and Pink Flamingo designer papers. The Stamp-a-ma-jig comes in very handy for perfectly lining up these images. I just love the bold flower images from the Garden Greetings set. Even though it's not in the 2009-2010 Idea Book and Catalog, it is on the Dormant List and you can still order it! I think this is a bright and cheery card that would make anyone feel a little better if they received it! 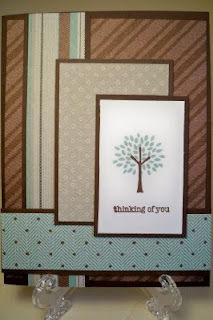 I used the Old Olive dotted piece from the Cottage Wall Designer Papers and stamped the Garden Greetings flowers in Rich Razzleberry, Old Olive and Summer Sun right over the patterned paper. The ribbon is the 1/2 inch Rich Razzleberry polka-dot grosgrain adhered on the reverse side. And the Scallop Oval punch adds a nice finishing touch. I'm off on vacation for a long weekend to visit family in St Louis. Check back the beginning of the week for more posts! Even though sympathy cards aren't so great to have to give, I still feel good making them because I know people will appreciate that extra handmade touch during their tough times. I followed this Splitcoast sketch challenge #240 for the card. 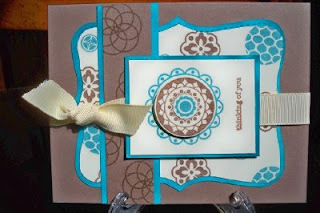 It's easier to see in real life, but I ran the Whisper White card stock through the Big Shot using the Stampin' Up Backgrounds 1 texturz plates. I used the Night of Navy patterned papers from the Hostess Level 1 Patterns Pack Designer Series Papers. And I colored the flowers and stems with Night of Navy and Always Artichoke markers. These two specials are only available for a limited time! Check my website here for more info! Just for Kids...and the Kid in You! From August 1–31, get a FREE package of Designer buttons—a $7.95 value—when you spend $35 on stamp sets in the Growing Up section of the catalog or my Online Store. These cute buttons can add that special touch to any project. Look for some samples next week that feature the buttons! 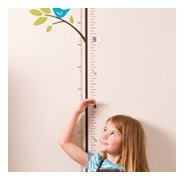 Track your children's growth with the limited-time Décor Elements™ Growth Chart, now on sale for just $24.95. But hurry—it's only available through September 30! It's Tuesday and that means another color combination over at Splitcoast here. 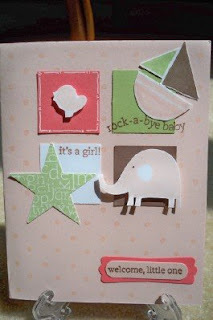 I needed a baby girl card so I thought the Nursery Necessities stamp set would be perfect! This layout is similar to another one I've done but it's so easy to incorporate the colors this way! The colors are Close to Cocoa, Blush Blossom, Certainly Celery, Cameo Coral and Whisper White. I'm SO excited! 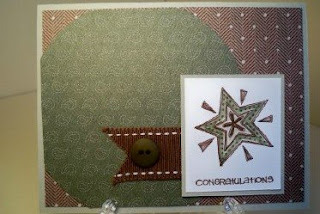 One of the cards that I sent into Stampin' UP for the Stampers Showcase made it to their website on Saturday, August 1st!. It's this card here from my post back on June 22nd. It's nice to be able to share my creations! Now to today's card. 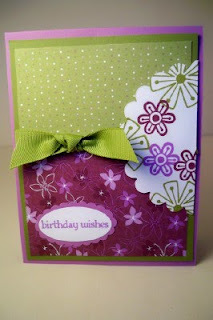 I'm playing along with this weeks' Stamping 411 challenge here. I can't say enough how fun and easy these challenges are yet they always result in really cute cards (in my humble opinion of course)! I used another stamp from the Fun & Fast Notes set. I thought it would compliment the masculine look of these papers. And who doesn't need more "manly" cards? Happy Monday means another Mojo Monday Challenge here. And for me another Christmas card. I just pre-ordered from the Holiday Mini and am eagerly awaiting more Christmas goodies. 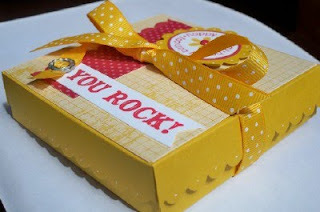 I got some fun stamp sets, designer papers and of course, ribbon too! But for now I used what I had on hand to play with this challenge. 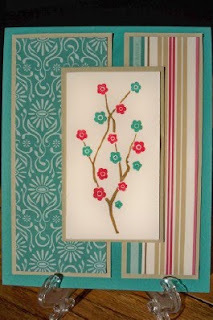 The Old Olive patterned paper is actually from the Cottage Wall designer papers. 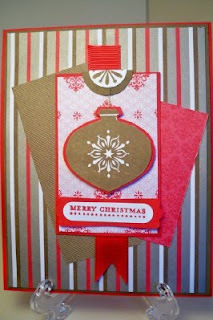 And I ran the Real Red card stock through the Backgrounds 1 texture plate to add the little polka dots to match the Real Red 3/4 inch Polka dot grosgrain ribbon. I colored the Loads of Love truck image with inks and my blender pens. This set is great for lots of occasions and I really should use it more often!